Not sure this is real or a hoax (Update: It's real! ), but what if you added monsters to the world of Ticket to Ride? 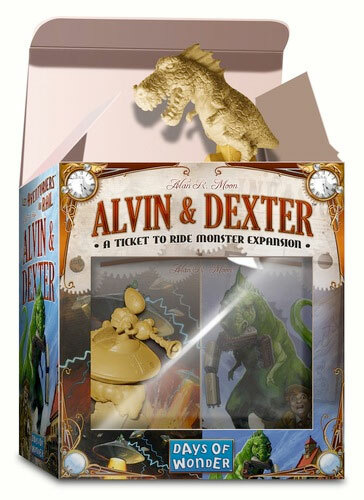 Either the folks at Days of Wonder have a screw loose or this idea for this "Alvin & Dexter" expansion might actually be brilliant! A forum user at BoardGameGeek.com discovered this product being listed on Japanese site AmiAmi.jp, an online retailer for miniature figures. If this does play out to be a real expansion, it's quite an unexpected twist for the TtR world created by Days of Wonder. However, given that I'm a huge fan of the series, any expansion is welcomed these days. This expansion set unleashes two monsters to the world of Ticket to Ride. The monsters raid on the cities one after another, blocking the railways to the cities they are staying. The monsters can be transferred to another city by using cards. Based on the limited description provided, it would seem that this is a "negative effect" expansion, which I'm pretty sure we haven't seen much of in the Ticket to Ride universe. To this point, the only thing that really had a negative impact on your ability to complete routes is an opponent blocking you by taking the route first. The description here seems to indicate that this expansion would introduce a new type of blocking, whether it be random or initiated in some way by a player. Maybe it's like the "Robber" in The Settlers of Catan or the "Dragon" in Carcassonne, both of which disrupt gameplay and point scoring. 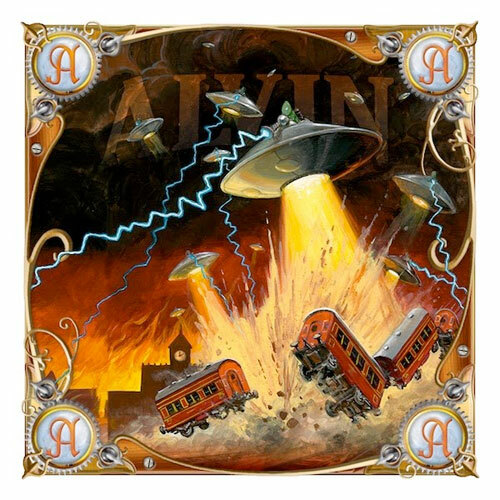 Also, is "Alvin" a monster who flies a UFO, while "Dexter" is some sort of Godzilla-like creature? The artwork looks "official" given the style that Days of Wonder typically uses for their products, though the dimensions of the design aren't typical of what we find in previously-released expansions (which tend to be small box, tall and narrow). This artwork has the dimensions typically associated with a standard release of the game (square box, found with USA, Europe, Switzerland, and Nordic Countries). In any case, the infusion of monsters to a game that historically has been set in reality and turn-of-the-century theme is quite a break from the norm. However, given how the franchise is aging (the original game was released in 2004), maybe this will spice things up a bit. Or maybe we'll discover that it's just one big hoax and look stupid. We'll see! Trends are a constant in the board game industry, as they are in any industry. Gamers looking back through the years will see pirates, vikings, Rennaissance happenings, European expansion, European merchantilism, haberdashery and many other topics rise and fall among trends in games hitting the market. 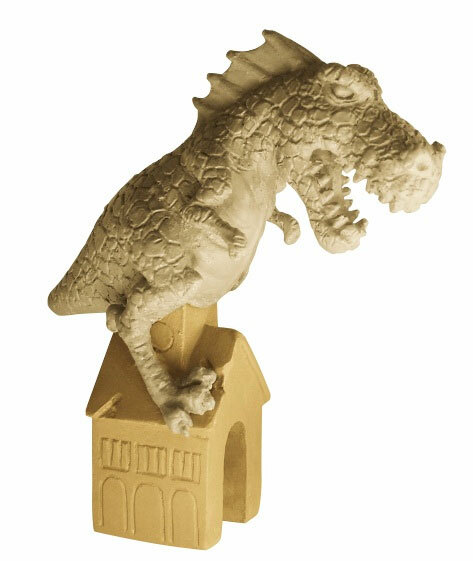 For 2011, the trend appears to be giant monsters that destroy things, with Richard Berg's Godzilla: Kaiju World Wars coming from Toy Vault, Richard Garfield's King of Tokyo coming from IELLO, and now the newly announced Alvin & Dexter – A Ticket to Ride Monster Expansion from Alan R. Moon and Days of Wonder. These monsters stymie players both during the game and once it ends. During play, no routes can be built into or out of a city where Alvin or Dexter are currently nesting, and during the final score tallying, any destination ticket showing a city where either monster stands is worth only half its normal value. Desperately need to build a route to Seattle, Paris or wherever else a roaming monster has set up shop? Discard one (or two) wild locomotive cards, and you can move the monster up to three (or six) cities away from its current location. Move a monster more than any other player, and you'll pick up an endgame bonus for your role as monster minder. 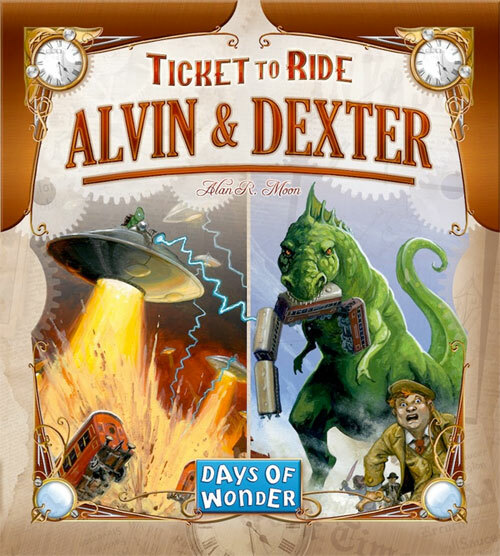 Alvin & Dexter – A Ticket to Ride Monster Expansion, which includes twenty monster cards, two bonus cards and rules in eleven languages in addition to the two figures, retails for $13/€10 and will stomp into stores in February 2011.